I enjoy going all out on costumes. I’ve done it since I was a kid. I remember in my early years making myself a boom box, jack in the box, Hershey bar – just to name a few. I guess some things don’t change – even when you become an adult. This year, as a family, we decided to be the muppets. The kids had never seen the muppets, but they liked the idea when we showed them pictures of the characters. We have rented a couple Muppet Movies and watched some YouTube clips to expose them a bit more. They are all sold out now. Here are the costumes and a brief description of how we did it. If you would like more information, just email me. 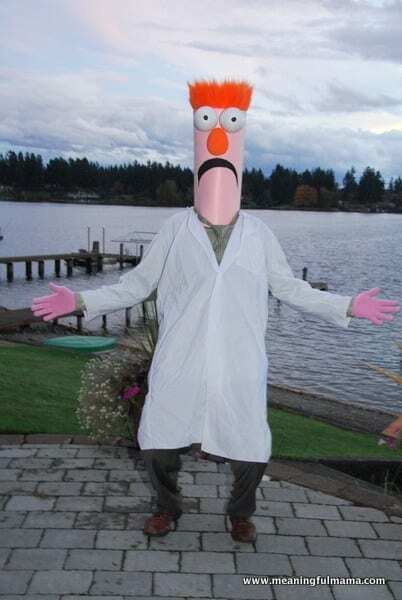 Beaker: My husband was Beaker. We took some tag board and used spray adhesive to attach the pink felt. Then, we cut a rounded, open slit for the mouth. We put black fabric that he could see out of but shielded his face. We attached orange fur as the hair with hot glue. We then turned the tag board into a cylinder by using duct tape and hot glue. We glued a paper plate in the head to create stability. Then, we took an egg shaped foam piece that we painted orange and hot glued above the mouth opening. We hot glued the foam eyes on and added black paper eyeballs. Finally, we cut out notches for my husbands shoulders. The clothes consisted of a business shirt, slacks, tie and lab coat. He also had pink gloves, which he wasn’t thrilled about. Dr. Bunsen: I was Dr. Bunsen, and he was the most challenging to make. 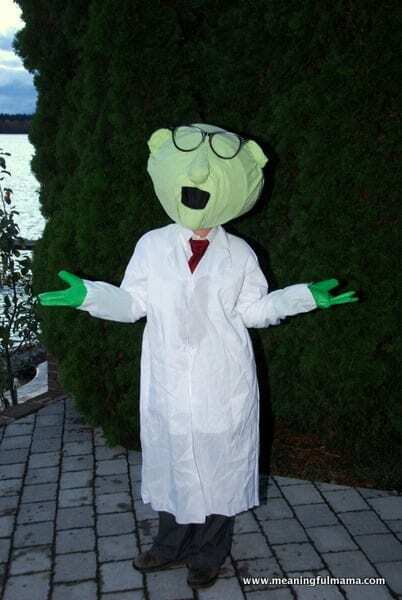 The only way I saw Dr. Bunsen made was paper mache. I don’t know why I didn’t want to do paper mache, but I didn’t. So, I came up with the idea to make the head out of a Chinese lantern. I had a 24 inch Chinese lantern. I wanted to use the inside wire as a brace for my head, so I planned accordingly, reinforced the area I wanted to cut out for my head with duct tape and then cut out a hole big enough for my head to go through. The challenging part was working the felt around the head. I started the fabric where the front of my neck would go. I did a couple folds around where the mouth and chin would go. I stuck a half of a foam ball under the fabric for a chin. 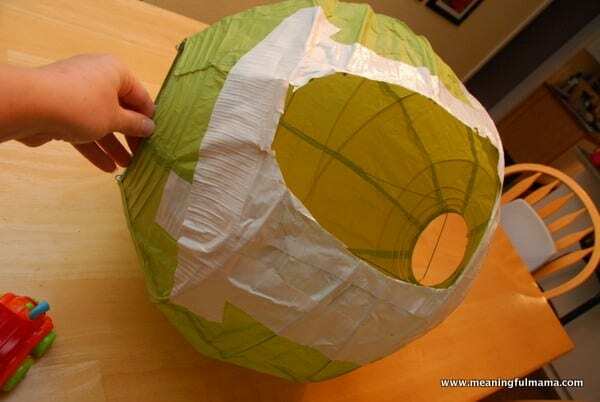 I used duct tape to attach the fabric in the cut out area and folded a couple duct tape pieces in circles to attach the fabric to the lantern. I used a piece of cardboard under the fabric for the ears and put a clear, small rubber band around them to hold the fabric in place. I then continued to pull the fabric and gather as needed until I reached all the way around the back of the head. I tucked the fabric inside and taped it down. The back of the head wasn’t perfectly flat, but I was OK with that. I cut out a hole for the mouth and added the black fabric that you can see through. We spray painted clown glasses black and attached them with hot glue. The nose is a half of a foam ball covered in fabric and then goes up to the bridge of the nose. The clothes were a business shirt, slacks, tie and lab coat. I had big green gloves too. Miss Piggy: Abby was Miss Piggy. 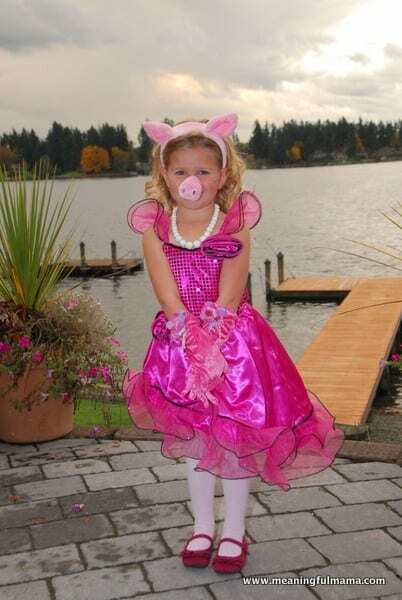 She had a glamour dress and the pig nose, ears and tail we purchased online. Animal: Kenzie was Animal, and this was definitely my favorite. I couldn’t find orange tights, believe it or not, so we stuck with red. I found some black sport pants at Goodwill that I cut zig zag around the knee area. I found an orange long sleeve shirt at Goodwill too. The vest is two t-shirts (red and yellow). The yellow shirt I just cut short and straight down the center to make the vest. The red t-shirt I just used as fabric that I cut into flame looking things. I finished it off with some sequin trim. Kenzie’s head was easier than it looks. We came up with the idea to attach pink fur to a bike helmet. The bike helmet had venting areas with a mesh fabric. We just pinned it on there. We used a little hot glue around the brim of the helmet. Once the hair was on, we added the foam eyeballs and painted orange foam nose. We used a hot glue gun to attach those. She had drumsticks as an accessory. 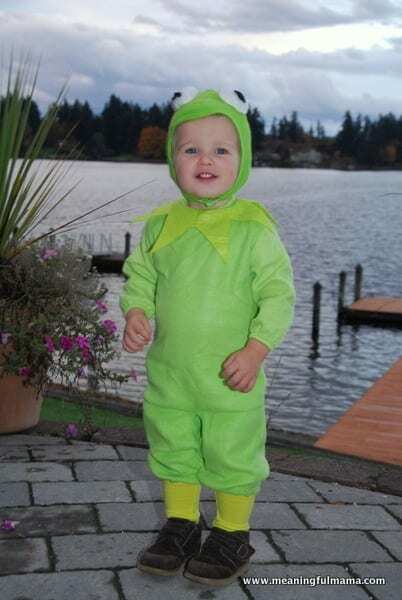 Kermit: Corban was Kermit, and we bought his costume. With costumes complete, we were able to head off to our church Harvest Carnival. How did you do the chain…did you buy that? Yeah – the chain I found at Goodwill. 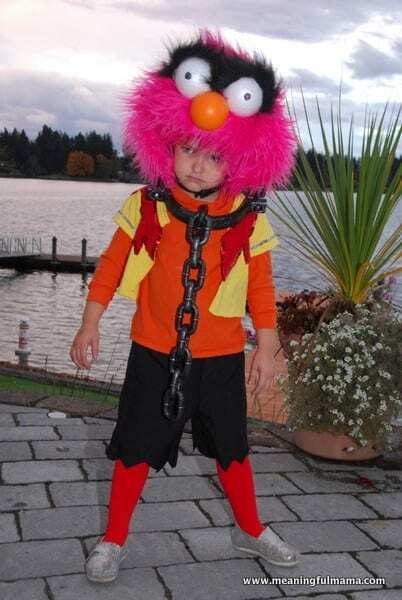 Was it sold for the “animal” muppets costume? I have never seen that. Amazing work, btw. You rock…as always. Loves to you. No – it just came as a general accessory. It had arm shackles too, which we removed. Thanks, Tricia! You guys looked great! You are very creative and talented. loved your costumes. I just pinned for inspiration next year so cute. Adorable costumes! I am a huge fan of family costumes. Great job. Thanks so much. We really get into the costumes. I haven’t even figured out what we’ll be doing this year though. Time for a family meeting to see what we can come up with. Thanks for commenting! I love this! We were the muppets a few years back too and it’s still one of my favorites. 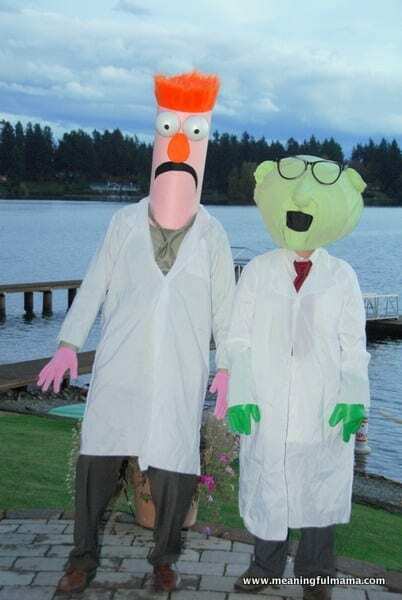 I absolutely love the beaker and Dr. Bunsen! I’ve been thinking about doing that for years but has no idea how to do it. 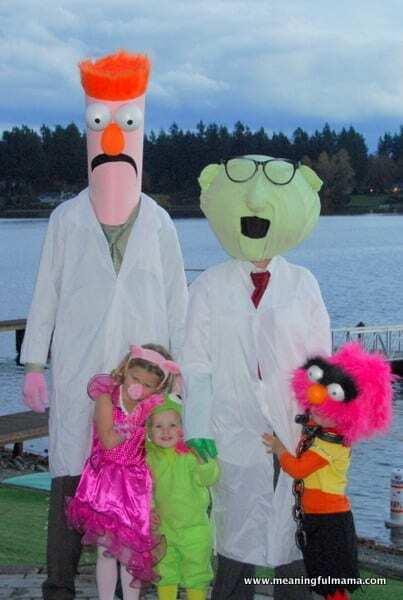 I love all your family costumes! Thank you so much. Dr. Bunsen was especially hard to figure out how to create. We made quite a scene at the harvest party though. Thanks so much for commenting!